A family of two gets a water bill for $800. Another family of two in the same county gets a water bill for only $65, but a single person in the same county gets a water bill for an incredible $2,400! The interesting thing is that even though there are variations in household size and bill amounts, the county cannot provide a definite or rational answer as to why suddenly people are receiving unexpectedly high bills, even though there are no extreme uses of water (i.e., outdoor sprinkler systems, pipe leaks, etc.). Welcome to DeKalb County, Georgia, folks. Yes, the fourth largest county in the state, and one of the 29 counties that make up the Atlanta-Sandy Springs-Roswell metropolitan statistical area. These billing issues have been around for several years, and the county has not given much confidence to its citizenry (which includes me) that the issues will soon be resolved. The county’s Department of Watershed Management is responsible for this public utility. The department asserts that, “Providing the highest quality product, service and management,” and “Promoting collaboration among employees and the community,” are two of the ways in which it fulfills its mission. Yet, there is a clear disconnect between the provision of this public service by the county government and the way in which this is received by its customers. Several factors contribute to the county’s current water billing crisis, including: inaccurate or no meter readings by county technicians or contractors; outdated water meters and antiquated software generating irrational water use and billing amounts; human error on data entry; and lack of timely and quality response to customer complaints by county representatives regarding the excessive bills. Collectively, these are major infrastructure failures. May 2018: “Our problem with Dekalb Water & Sewer exorbitant bills started in Sept. 2017 when the bill jumped from $65.00 bi-monthly to $468.00. Our latest bill was over $3,000 in April. Dekalb Water Shed switched out the meter in December but the bill has not decreased. 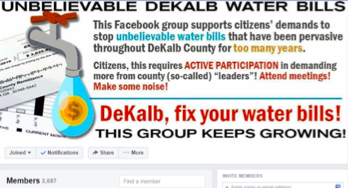 Citizens’ Facebook page in response to DeKalb County water billing issues. In late March 2019, the DeKalb County CEO sent a status update to me and the other 194,000 county water customers. According to his letter, all customers “…have returned to normal billing as of March 2018.” Considering the dates of the various Facebook comments posted above, it is hard to understand why the CEO would make such a statement. He then informs us of a 3 year process in which 102,000 old or defective water meters will be replaced with new ones. At the earliest and without anything unforeseen, all things related to water billing could be back to “normal” in DeKalb County in 2022. In the meantime, public trust has already been compromised by this issue. My husband and I moved to DeKalb County 5 years ago for many reasons. We both work in the county, which has a wonderfully diverse population. It is home to major organizations such as Emory University and Emory Healthcare, Cox Communications, the Centers for Disease Control and Prevention, and the Atlanta VA Health Care System. It is close enough to Atlanta to be convenient without actually being in the City of Atlanta, and it is full of good people. If we did not live in the county now, we would probably think twice about moving here. All the local media coverage regarding this water issue, and the seeming lack of progress on the county’s part in proactively addressing the billing issues with its customers would certainly give us pause. While that is true, I still struggle with what has or what has not happened in the decades since. Was there no thought by anyone in the county government—elected or otherwise—that perhaps system infrastructure, equipment and software within the Watershed Department would need to be upgraded? Or, was it simply more politically expedient to, “Put if off just one more year?” And though everyone acknowledges that problems exist, why are customers’ billing issues still not resolved? This was a completely unnecessary infrastructure failure for Dekalb County. While the provision of clean drinking water was not compromised, the taxpayers’ trust in the county government being able to effectively manage all aspects of water service (and other county infrastructure) may never be fully restored. Author: Carmen Ashley is pursuing her doctoral degree in public administration at Valdosta State University. She is a graduate of the Rollins School of Public Health at Emory University, and a resident of DeKalb County, Georgia. Her email is [email protected], and her Twitter handle is @CarmenLAshley.